Spiedo Ristorante Celebrating its Grand Closing! After 24 years of business in downtown San Mateo, Spiedo is closing its doors and celebrating with special menus and 1/2 OFF Wine List. 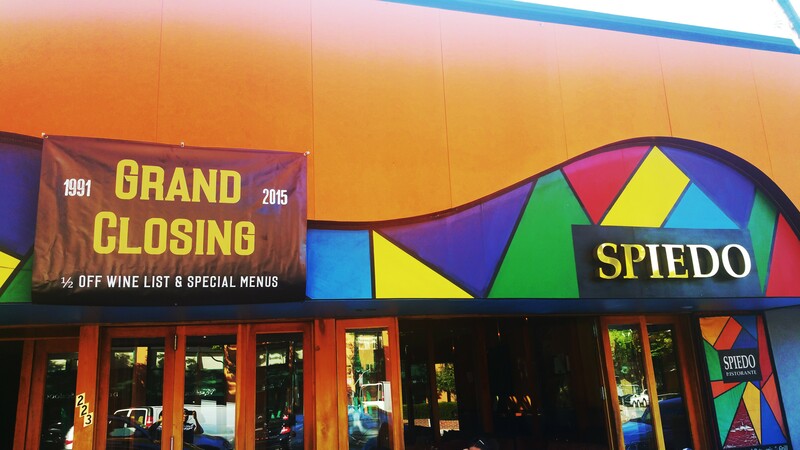 After 24 years of business, it is time for Spiedo Ristorante to celebrate its Grand Closing. Spiedo Ristorante served as a landmark in downtown San Mateo for more than two decades, serving up some of the best rustic, Italian cuisine in the Bay Area. But after 24 years of business, it is time for Spiedo Ristorante to celebrate its Grand Closing. To thank all of Spiedo’s guests for their patronage since 1991, a new menu has been made up for the occasion to feature all of the Ristorante’s most well-known and popular dishes. Plus, all of the fine Italian and California wines are marked at an additional half-off. For lunch and dinner, an exclusive three-course menu will be available. Additionally, during their Grand Closing celebration, private events will still be held on site, so don’t wait to book your last hoorah at Spiedo Ristorante! The staff at Spiedo Ristorante looks forward to seeing guests stop by for the celebration of these final months of business at Spiedo in downtown San Mateo. As a thank-you to all of the guests and customers, indulge in the special menus and limited-time-offer wines! From everyone at Spiedo Ristorante, Cent'anni e Mille Grazie! Spiedo Ristorante has been the destination for traditional Italian food since 1991, located in the heart of downtown San Mateo on the San Francisco Peninsula in Silicon Valley. Rustic Italian Cuisine includes dishes from our famous Mesquite-fired Grill and Rotisserie and Oak-burning Pizza Oven. Housemade pasta, local produce, and the freshest seafood are featured on our menus. We have an impressive Wine List including wines from Umbria, Toscana, Sicilia, Piemonte, the Veneto, and California. Private Dining Rooms can accommodate groups from 8 to 140 guests for Banquets, Luncheons, Celebrations, and Cocktail Parties!